Louis Grignion was born at Montfort in Brittany, north western France, on January 31, 1673. As a child he developed an ardent devotion to Our Blessed Lady and at his Confirmation added the name Mary to his own. Henceforth he always signed himself Louis-Marie de Montfort. From these early years his one ambition was the priesthood, and he was ordained a Priest on June 6, 1700. His life apostolate was entirely devoted to the poor and promoting devotion to the Blessed Virgin. Early in his priestly career, he founded the Congregation of the Daughters of Wisdom who, to this day, direct schools, orphanages and hospitals in various parts of the world. 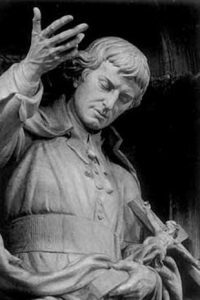 More information on St. Louis de Montfort can be found at www.newadvent.com. Great Apostle and Lover of our Blessed Lady, St. Louis De Montfort, whose one desire is to set the world aflame with love for Jesus through Mary, we entreat you to obtain for us childlike, persevering, perfect devotion to Mary, so as to share in Mary’s faith, hope and charity, and to receive the favor we beseech you to obtain for us.